Some people call him the “Robert Parker of beer” – but you couldn’t hold that against US craft beer guru and raconteur Garrett Oliver. He’s also an award-winning brewmaster at Brooklyn Brewery and the author of 2003’s The Brewmaster’s Table: Discovering the Pleasures of Real Beer with Real Food, a book that takes the art of pairing beer and food seriously. It was a groundbreaking book at the time, but only within the rarified world of beer connoisseurs; now it’s selling faster than ever and, Garrett pointed out, has just earned out its advance. It only took a dozen years. Fortunately things are moving faster in the beer world now, as it expands and develops. 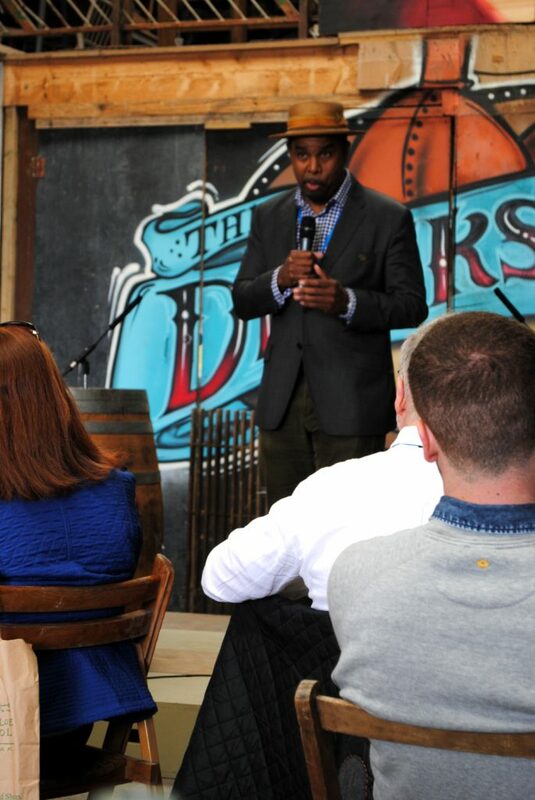 Garrett came to East Cork in May, to fly the flag for beer at the Ballymaloe Litfest. We did an “in conversation” event in the Drinks Theatre (aka the tractor shed!) early on Saturday morning which started off slow and relaxed. By the time it ended, showman Garrett had acquired an audience that took over every seat in the venue and overflowed out into the path. Five minutes after that event ended, the tickets for his Sunday talk and tasting had sold out. I was never so glad to have purchased one in advance! Articulate, knowledgeable and highly entertaining, Garrett put beer very firmly at the heart of the drinks theatre. He was as comfortable debating with wine, whiskey, gin and cocktail experts about wine going out of fashion (good score for the beer side!) as he was doing a tasting of rare Brooklyn Brewery brews. We moved through a flight of beers that included the super dry saison Sorachi Ace, with herbal dill notes; nutty flavoured, spelt ale Hammarby Syndrome, brewed to celebrate the brewery in Stockholm; a ghost bottle called Galahad, aged on lees from a natural cider fermentation; the brett horse blanket aromas of Wild Horse Porter; super-dark cherry flavours of K is for Kriek (definitely my favourite); and – finally! – gloriously rich brandywine Hand & Seal, aged in bourbon barrels. Garrett Oliver – the man who puts the word master into brewmaster. Come back to Ireland any time, Garrett. 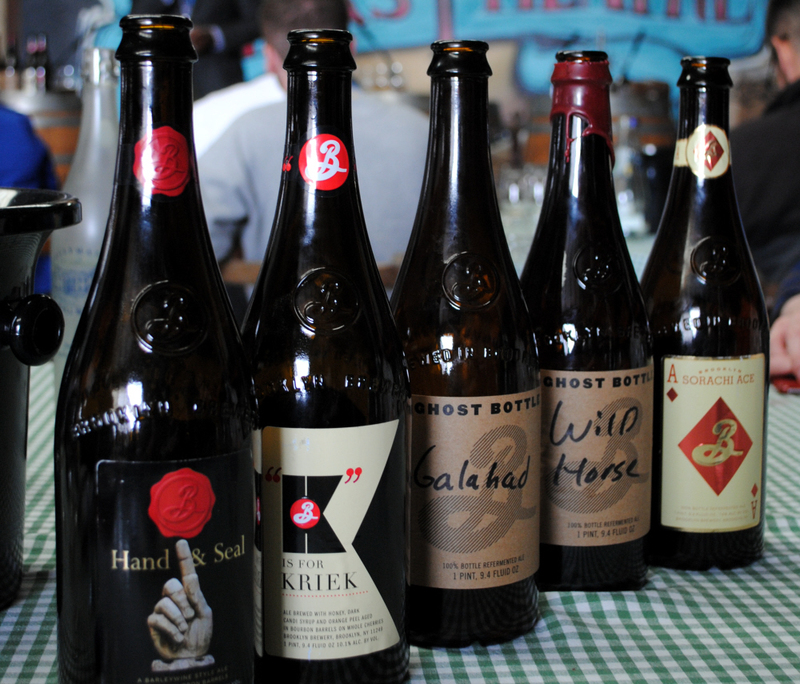 Just bring a few more of those bottles of kriek with you. Listen to my Lyric FM Culture File interview with him here. Kristin and I will be doing a talk on Irish craft beer and cider as part of Culture Night at the superb Hodges Figgis bookshop on Dawson Street in Dublin. I will be MC for the COOK programme at the GIY GROW Fest in Waterford, hosting demos from Darina Allen and Rory O’Connell, Gaby Wieland, Mark Diacono, Lilly Higgins, Tom and Johann Doorley and Chef Adrian. Make sure you catch keynote speaker Joanna Blythman, author of stop-you-in-your tracks books like What to Eat: Food that’s good for your health, pocket and plate, Bad Food Britain: How a Nation Ruined Its Appetite and, most recently Swallow This: Serving Up the Food Industry’s Darkest Secrets.